The Emisar D4S flashlights use a firmware named RampingIOS V3. (The Emisar D4, D1, and D1S all use RampingIOS V2.) There's not really a manual; the only thing we get is the diagram on the right. It's reasonably comprehensive, but there's a fair amount of detail it merely summarizes, so I thought a textual manual would be nice. The Emisar D4S only works when the head and tailcap are tightened fully. You can physically lock it out--prevent it from turning on accidentally--by simply loosening the tailcap a small amount. A quarter turn will do it. Emisar lights are known for their ramping interfaces. Rather than have a small number of distinct brightness levels, they can vary their brightness anywhere between their lowest and highest levels, like a light on a dimmer. The D4S is in ramping mode by default, but it also has a stepped mode that can be configured to be closer to how non-ramping lights work. Each mode--ramping and stepped--can have differently-configured brightness floors and ceilings. The driver for the D4S has two different chipsets. At low brightness levels, a fairly-efficient but low-power chipset (called a 7135) is used. These lowest brightness levels are called the "regulated levels". Each regulated level will always be the same brightness regardless of how much charge the battery has. Above a particular brightness level, the light switches over to a less-efficient but high-power chipset (called a FET). These levels are called "direct-drive". The brightness of the direct-drive levels is directly related to the battery's charge level; the more charged the battery, the brighter the levels. The light is at its most efficient, in terms of power used for every lumen generated, at the brightest regulated level. When the light is first powered by tightening the tailcap, it will default to this level. At higher brightness levels, the light's LEDs generate a lot of heat. If the light exceeds its configured maximum temperature, it will begin dimming itself automatically until the temperature drops below the allowed maximum. The D4S has a set of cyan-colored auxiliary LEDs that can be on when the main LEDs are off. You can configure the behavior of the aux LEDs. The default mode for the light is ramping mode. Triple-pressing the button (3 clicks) while the light is on will toggle between ramping and stepped mode. While the light is off, press and release the button (1 click) to turn it on. It will turn on at the last-used brightness level. (This is called "mode memory".) Immediately after loosening and tightening the tailcap (or after changing the battery), the memorized level will be the light's max regulated level. When the light is on, 1 click will turn it off. The current brightness level will be memorized for future use. There's a fraction of a second delay between pressing the button and the light actually turning off. That's because of the way the light processes input; it's waiting to make sure you're only going to press the button once (since multiple presses will trigger other actions). When the light is on, holding the button down will brighten the light. In ramping mode, the brightness will increase gradually ("ramping up"). In stepped mode, the light will jump through increasing brightness levels. If you press, release, and then hold the button, it will begin dimming. In ramping mode, the brightness will decrease gradually ("ramping down"). In stepped mode, the light will jump through decreasing brightness levels. While the light is changing, if you release the button and immediately hold it again, the direction (dimming or brightening) will switch. In ramping mode, while the light is ramping, it'll briefly blink off and on again at two different brightness levels: the maximum regulated level and the brightness ceiling. While the light is off, double-pressing the button (2 clicks) will immediately jump to the brightness ceiling. While the light is on, 2 clicks will jump to the maximum brightness level, regardless of the configured brightness ceiling. Another two clicks will go back to the previous brightness level. While the light is off, if you hold the button the light will turn on at its lowest level. If you continue holding the button, the light will begin brightening from there. The light has several different configuration modes. Each of those modes works more or less the same way. The mode will have a series of menu items that it will go through. For each menu item, the light will first blink a number of times corresponding to the item number (first, second, etc.) After that, the light will begin fluttering on and off fairly quickly. While the light is fluttering, you can click the button a number of times; the light will count the number of button presses and use that number as its new configuration for that menu item. After a short period of time, the fluttering will stop and the light will move on to the next menu item. After the light has gone through all of the menu items, it will return to whatever mode it was in before entering the configuration mode. If you don't press the button during a particular menu item's fluttering, that item will remain unchanged. While the light is on, 4 clicks will enter ramping or stepped configuration mode, depending on which mode the light was in before the 4 clicks. During the floor configuration, press the button equal to the number of ramping levels (out of 150) at which the floor should be. To set the lowest possible floor, click the button once. The ceiling is configured similarly, but you press the button equal to the number of steps away from maximum brightness. To set the highest possible ceiling (at max brightness), click the button once. The other modes largely involve multiple clicks from off. Most of them are not generally needed for everyday use, but they supplement the light's basic operations. From off, 3 clicks will enter "BattCheck" mode, which blinks out the current battery voltage. First it blinks the number of volts, then it pauses, then it blinks out the tenths of volts. Thus, if the battery were at 3.5 volts, the light would blink three times, pause, then five times. For zeroes, it gives a very short blink. A fully-charged lithium-ion battery is 4.2 volts. The light considers 2.8 volts to be an empty battery and won't turn on if the battery is at or below 2.8 volts. The voltage sequence will continue blinking until you turn off the light with a single click. While the light is in BattCheck mode, 2 clicks will enter TempCheck mode. Instead of blinking out the battery voltage, the light will start blinking out its current temperature in degrees Celsius, first the tens digit then the units digit. Like BattCheck mode, the light will continue blinking out the temperature until you turn it off with a single click. While the light is in TempCheck mode, 4 clicks will enter thermal configuration mode. See the thermal configuration mode documentation below for how that works. From off, 4 clicks will enter "tactical" or "momentary" mode. The light will flash once to show that it's entered the mode. The auxiliary LEDs will turn off (if they were on). In tactical mode, the light will turn on at its memorized brightness for as long as the button is being held down. It will turn off as soon as the button is released. There's no button press combination that will exit tactical mode. To exit it, you will have to partially unscrew and retighten the tailcap. From off, 6 clicks will enter lockout mode. The light will flash twice to show that it's entered the mode. There's a separate aux LED mode for lockout mode, so you can tell whether the light is in lockout or not. In lockout mode, pressing the button will turn on the light at its lowest brightness ("moonlight mode") for as long as the button is held down. Another 6 clicks will exit lockout mode. The light will flash twice to show that it's left the mode. While in lockout mode, 3 clicks will cycle through the various settings for the aux LEDs in lockout mode. The four modes are, in order: low, high, blink (on high), and off. The default mode is blink. Remember that loosening the tailcap a quarter turn will also lock out the light. Using the 6 clicks is called "electronic lockout", while turning the tailcap is "physical lockout". From off, 7 clicks will cycle to the next aux LED mode. The four modes are, in order: low, high, blink (on high), and off. The default mode is low. From off, 8 clicks will enter beacon mode. In beacon mode, the light will blink on and off every few seconds. By default, the light will blink every two seconds. To change the timing, use 4 clicks while in beacon mode. The light will enter a one-item menu. During the flickering for input, press the button a number of times equal to the number of seconds between blinks. 1 click will exit beacon mode. From off, 10 clicks will enter thermal configuration mode. You can check the default calibration by entering TempCheck mode from a room-temperature light. The D4Ss are supposed to go through a temperature calibration at the factory, so hopefully most of them won't need manual thermal calibration. The temperature ceiling is simply the highest temperature the light should be allowed to reach. Once it hits its temperature ceiling, it will progressively dim itself until the temperature stabilizes below the ceiling. Note that the number of clicks in that menu option is added to 30 to reach the actual ceiling. (Thus, you can't set a ceiling below 31°C.) The maximum allowed ceiling is 70°C. The default temperature ceiling is 45°C. The Emisar D4, D1, and D1S flashlights all use a firmware named RampingIOS V2. (The earliest D4s were released with V1, but there aren't many of those around. The Emisar D4S uses RampingIOS V3.) There's not really a manual; the only thing we get is the diagram on the right. It's pretty comprehensive, but I thought a textual manual would be nice, so I decided to write one. The Emisar lights only work when the head and tailcap are tightened fully. You can physically lock out the lights--prevent them from turning on accidentally--by simply loosening the tailcap a small amount. A quarter turn will do it. The lights use a ramping interface. Rather than have a small number of distinct brightness levels, they can vary their brightness anywhere between their lowest and highest levels, like a light on a dimmer. The drivers for the lights have two different chipsets. At low brightness levels, a fairly-efficient but low-power chipset (called a 7135) is used. These lowest brightness levels are called the "regulated levels". Each regulated level will always be the same brightness regardless of how much charge the battery has. Above a particular brightness level, the light switches over to a less-efficient but high-power chipset (called a FET). These levels are called "direct-drive". The brightness of the direct-drive levels is directly related to the battery's charge level; the more charged the battery, the brighter the levels. The lights are at their most efficient, in terms of power used for every lumen generated, at the brightest regulated level. When the light is first powered by tightening the tailcap, it will default to this level. At higher brightness levels, the lights' LEDs generate a lot of heat. If a light exceeds its configured maximum temperature, it will begin dimming itself automatically until the temperature drops below the allowed maximum. While the light is off, press and release the button (1 click) to turn it on. It will turn on at the last-used brightness level. (This is called "mode memory".) Immediately after loosening and tightening the tailcap (or after changing the battery), the default level will be the light's max regulated level. When the light is on, 1 click will turn it off. The current brightness level will be memorized for future use. When the light is on, holding the button down with gradually brighten the light ("ramping up"). If you release the button and immediately hold it again, the ramping direction will switch, so if it had been ramping up it'll be dimming ("ramping down") afterward. While the light is ramping, it'll briefly blink off and on again at three different brightness levels: the minimum brightness, the maximum brightness, and the maximum regulated level. While the light is either on or off, double-pressing the button (2 clicks) will immediately jump to the maximum brightness level. Another two clicks will go back to the previous brightness level. If the light was off before the the initial two clicks, the second two clicks will go to the memorized brightness level. While the light is off, if you hold the button the light will turn on at its lowest level. If you continue holding the button, the light will begin ramping up. The other modes largely involve multiple clicks from off. They're not generally needed for everyday use, but they supplement the light's basic operations. From off, 3 clicks will enter "BattCheck" mode, which gives the battery level. It blinks out the current battery voltage. First it blinks the number of volts, then it pauses, then it blinks out the tenths of volts. Thus, if the battery were at 3.5 volts, the light would blink three times, pause, then five times. For zeroes, it gives a very short blink. From off, 4 clicks will enter "tactical" or "momentary" mode. The light will flash four times to show that it's entered the mode. In tactical mode, the light will turn on at maximum brightness for as long as the button is being held down. It will turn off as soon as the button is released. Another 4 clicks will exit tactical mode. The light will flash twice to show that it's left the mode. From off, 6 clicks will enter lockout mode. The light will flash four times to show that it's entered the mode. In lockout mode, the light will not turn on, no matter how the button is pressed. From off, 8 clicks will enter beacon mode. In beacon mode, the light will blink on and off every two and a half seconds. From off, 10 or more clicks followed by holding down the button will enter thermal configuration mode. In thermal config mode, the light will first blink out the current maximum temperature. As with TempCheck mode, it blinks the tens digit followed by the units digit. If you release the button at this point, the light will turn off and no changes to the configuration will be made. If you continue to hold the button, the light will then flicker for a second or so. After that, it will turn on at its maximum brightness. It won't turn off until you release the button, which you should do when you feel like the light has gotten too hot. The temperature at that point will be the new maximum temperature. The light will blink out that new maximum temperature and then turn off. The default temperature threshold is 45°C. I listen to a lot of podcasts, usually while I'm in the car, but also when I'm doing yardwork and similar solitary tasks. These are the podcasts I listen to. I break my podcasts into several categories and generally listen to the categories in order. (I listen to all of the news podcasts before starting on the politics podcasts, and so on.) My currently-preferred podcast client, BeyondPod, lets me set up a "smart playlist" that puts everything in the appropriate order automatically every time I update my feeds. BeyondPod also lets me speed up podcasts. I listen to most of my podcasts at 1.5x playback speed. I can still process the information comfortably, but it gets through them faster. Exempted are more highly-produced podcasts and ones that are really short anyway. First, I listen to my "News" podcasts. These are short and, well, about news. I listen to these in reverse chronological order, so I get the newest news first. The NPR News Now podcast is updated every hour and contains a recording of the five-minute news summary they make available to their member stations at the start of every hour. I have BeyondPod update its feeds within an hour of my normal times for leaving home and work, so I always start off my listening with an up-to-date news summary. Schedule: Every hour, but you (obviously) only ever need the most recent episode. Playback: 1x because it's short. Up First is NPR's podcast version of a morning show. It's hosted by the same people who host Morning Edition, and it's available every weekday morning. It spends about ten minutes discussing two to four news topics in more depth than the hourly news summary can cover them. Schedule: Every weekday, posted by 6am Eastern time. Playback: 1x because it's relatively short. Schedule: Somewhat ad-hoc; it depends on what reporting WAMU has done on a given day. In general, there are three to five short episodes every weekday. The podcasts in this section are ones that cover topical issues, with a focus on politics. I try to stay up to date on all of their episodes. Sometimes I skip individual episodes in the interest of keeping up with all of them. I'm a bit on the fence about 1A, hosted by Joshua Johnson. I want a podcast that covers a wide range of relevant topics, particularly politics and cultural issues, and I want to come away from discussions with a sense of understanding the perspectives on all sides of an issue, regardless of whether I agree with them. The Diane Rehm Show used to be very good at that; Diane assembeled good panels for discussion, and she was extremely talented at guiding the discussion for the edification of her listeners. 1A took over Diane Rehm's time slot and covers the same sorts of topics, to a first approximation, so I've been listening to it since its inception. 1A is different in a few ways, of course. The focus of the cultural topics is a bit different, but I generally like the topics covered by the show. I don't think Joshua Johnson is as good a host, though. Diane was good, in my opinion, at guiding her guests to present useful information and perspectives to her listeners. Joshua has often come off as condescending or offputting to his guests, in ways that I don't think have contributed to genuine, useful conversations. (In more than one show he's asked a guest a question that basically came off as him saying, "Do you even understand why people think you're wrong?") I'm a little on the fence about what they've done with the podcast format, too. The radio show is two hours long, with a different topic each hour. For the podcast, they pick one of the two topics and edit that show down to a half hour. If you want to listen to the other show, you have to go to the website; it's not available in a podcast. I still feel like I'm getting useful information and perspectives from the show, but not to the same degree as I got from the show that previously filled my "topical panel discussion" need. If anyone has suggestions for better podcasts, I'm open to them. Schedule: One 30-minute episode every weekday, distilled from the two shows that aired that day. There's often a bonus episode on the weekend taken from one of the week's episodes that didn't get put into its day's podcast. Playback: 1.5x, on general time principles, but Joshua also speaks a little slowly and speeding him up helps. On My Mind is the podcast that Diane Rehm has been doing since she retired from hosting the on-air Diane Rehm Show. Every week she records and collects conversations with people where she discusses political or cultural topics. Her new format doesn't really cover the sort of broad, multifaceted discussions that I really liked about her old show, but she's still informative and insightful, so I'm still listening. Schedule: Weekly. One hour-long episode every Friday. Playback: 1.5x. Diane Rehm was the reason I started speeding up podcasts in the first place. She's an excellent host, but she talks extremely slowly. (There are health reasons for some of that, but it still makes it difficult to listen to her show sometimes.) Speeding her up makes it a lot easier to get past the way she sounds and get into the communication of ideas, where she excels. The Economist has the nice additional benefit of giving coverage of the US from an outside perspective. I appreciate that because pretty much all of the other podcasts I listen to are based on the US. Schedule: There are currently five podcasts; each one is published weekly on a different day of the week, so the all audio feed gets a new episode every weekday. The FiveThirtyEight Politics Podcast doesn't have its own page, but you can find it on the FiveThirtyEight Podcasts page. This weekly podcast features concrete, numbers-based discussions about political developments. I really like their approach to trying to understand the population's political opinions by asking them (generally through polls) and trying to fairly listen to the answers. Schedule: Weekly. Episodes are recorded around noon on Mondays and posted that afternoon. Sometimes they do "emergency podcasts" on other days to discuss particularly interesting political news developments. Schedule: Weekly plus. The hour-long radio show airs on Fridays, so they post new shows to the podcast feed on Fridays, too. The podcast also gets "podcast extras" every Wednesday. Playback: 1x. Although it might not sound like it at first, the show is very highly produced and edited. Each episode packs a lot more content into each time period than most of the other podcasts I listen to, so I leave this one at 1x playback. These podcasts are excellent places to learn new things. They're not necessarily as time-sensitive as the ones in my "Politics / Topical" section, so I get to these only when I've caught up on all the topical stuff. I am currently about five months behind on this section. 99% Invisible discusses the design of things made by humans, with a focus on architecture. I've learned a lot about all sorts of things that people have made from this show. Schedule: Weekly. One half-hour episode every Tuesday. Playback: 1x. This show has high production values and it's worth listening at regular playback speed. Radiolab tells stories about science. I've learned a lot from this podcast about new developments in science, obscure but interesting scientific discoveries, and science history. They also do a lot to try to express concepts and atmosphere through audio cues. At least one person I know finds their "bleeps and bloops" offputting and can't listen to them. Schedule: They don't seem to have a hard and fast schedule these days. They usually put out two to three episodes a month. Playback: 1x. A lot of work goes into the show's production, and it doesn't sound the same when sped up. The TED Talks audio feed is just that: an audio-only podcast of TED talks. I'm a little on the fence about this one. I've listened to some really great talks through this feed, but a lot are just okay or worse. The ratio is not really in the feed's favor. I haven't fully given up on it yet, though. Schedule: Every weekday. Most talks are 18 minutes or less. Playback: 1x. A lot of the talks could probably be sped up without issue, but the good ones usually have a rhythm and performace aspect to them that is better appreciated at 1x, so that's where I leave the entire feed. What's the Point was a podcast from FiveThirtyEight that discussed uses of data in various aspects of our world. One of the early episodes I distinctly remember was a discussion of analyzing traffic data in New York City to optimize traffic flows in Manhattan (including closing a street to improve the traffic). The podcast has ended, but I haven't yet listened to all of the episodes in the feed. Schedule: Ended. When it was active, it was weekly, with a new episode every Friday. If I ever get caught up on my "Education" category, I have the "Catching Up" category to work on. When I find a podcast that I like and want to listen to every episode of it, I put it in this category. Once I'm caught up on the podcast, it gets moved into an appropriate other category (usually "Education"). 99% Invisible, TED Talks, and Radiolab all started out here. Intelligence Squared US holds one or two debates every month on interesting topics, often political ones. Each debate begins with a motion, e.g. "Video games make us smarter." There are two teams in the debate; one argues for the motion and the other argues against. Each team has two members. The debate has three phases: opening statements, answering questions from the moderator and audience, and closing statements. The audience is polled about their opinion on the statement before and after the debate; the side that had the greatest increase in supporters is said to have won the debate. I don't care so much about who wins or loses, but the debates are generally good platforms for understanding opposing perspectives on contentious topics. Schedule: One to two hour-long episodes every month. Playback: 1x. I think the performace aspects of the debate are better expressed at normal playback speed. Questions about buying batteries come up periodically on the /r/flashlight subreddit. This is the guide I wish had existed when I had those questions. The primary focus of this guide is on batteries that go into flashlights, though some of what's here can certainly be applied to other battery-powered devices. If you just want to know how to get 18650 batteries, skip down to the Lithium-Ion section. Be careful when buying lithium-ion batteries from marketplaces like Amazon; unsafe batteries abound. See the section for advice on making safe purchases. Batteries can be separated into different types that largely have to do with their voltage. A battery's voltage is determined by the chemical reactions it uses to generate electricity (and occasionally with additional circuitry added to the battery). The usual way we refer to batteries (AA, AAA, C, etc.) specifically references their size, not voltage. Fortunately, for the most part, particular sizes only come in particular voltages. I'll note a few places you might have to take care. 1.5V - These include the most common battery types in use, including AAA, AA, C, and D.
3V - The most common 3V flashlight battery is the CR123A. Many button cells (watch batteries) are also 3V, like the common CR2032. Lithium-Ion - This is a whole class of batteries that have higher outputs and last longer than many other flashlight batteries, but they require more care in handling. Lithium-ion flashlight batteries usually have five-digit designations, like 18650 and 10440. I'm omitting stuff like 9V batteries and 6V "lantern batteries", since they're not used in flashlights to the same degree that the above categories are. Flashlights that use AAA, AA, C, and D cells are very common. They're useful because those cells are also very common. People sometimes refer to these batteries as either "primaries" or, less often, "secondaries". "Primaries" are synonymous with non-rechargeable; you use them and then throw them away. "Secondaries" are synonymous with rechargeable, though people will more often just call them "rechargeable". Alkaline - The cheapest and most common. Not recommended unless they're your only option. They're not rechargeable, so you have to replace them every time you use them up. They lose their charge over time, so if you leave them alone for a while, they might not even be useful when you do pick them up. They tend to leak, which becomes more likely the more they discharge (and remember, they lose charge even if you're not using them). When they leak, they can destroy whatever device they're in. Nickel-metal Hydride (NiMH) - Rechargeable. People will often refer to "Eneloops", a specific, well-regarded brand of NiMH batteries. Good for frequently-used flashlights because you can reuse them rather than buying new ones all the time. They also don't leak, so you don't run the risk of damaging your devices. Standard NiMH batteries lose charge much faster than alkaline batteries, but you can get "low self discharge" NiMH batteries that only lose their charge slightly faster than alkalines do. (Rough comparison: after a year without use or charging, an alkaline battery will have 80-90% of its original charge, an LSD NiMH will have 70-80%, and a regular NiMH will have 15-20%.) Although alkalines usually claim more energy storage than NiMH on paper, NiMH batteries tend to give longer runtimes in flashlights in practice because of the way modern flashlights use electricity. Lithium - Expensive, but long-lasting. Not rechargeable. These typically cost three times or more what alkalines do. (So do NiMH batteries, but those are rechargeable, so the cost is amortized over many reuses.) They lose their charge more slowly than alkalines, they can store more energy than alkalines or NiMH, and they don't leak. Good for devices you want to leave alone for months or years at a time and still work as soon as you pick them up again. There are rechargeable alkaline and rechargeable lithium batteries, but rechargeable NiMH are the most common at the moment. Nickel-cadmium (NiCd) used to be the most common rechargeable chemistry, but it's been replaced by the NiMH, which is better than NiCd in practically every way. In most cases, you should get NiMH rechargeable batteries for flashlights that get used frequently. For flashlights that sit and wait to be used (emergency flashlights, bug out bags, etc. ), use lithium primaries. Lithium batteries handle temperature extremes better than NiMH and alkaline batteries, so lithium is also the best choice for things like flashlights that live in cars. The Wirecutter has recommendations for NiMH AA and AAA batteries and NiMH AA and AAA chargers. 3V batteries are common in a number of more niche devices, like cameras. There are a lot of flashlights that use 3V CR123A batteries. Pretty much every 3V battery uses lithium, so everything about lithium in the 1.5V section applies to 3V batteries, too. The higher voltage lets some CR123A flashlights put out more light than similarly-sized AA flashlights. Aside from that, there's not much to consider about buying CR123A batteries. The Parametrek battery database lists several CR123A batteries ranging from $1.50 to $5 apiece. On Amazon, Amazon Basics, Streamlight, and Energizer CR123A batteries range from $1.50 to $2 apiece. All of the usage considerations in the lithium-ion section apply to RCR123A batteries, too. Lithium-ion batteries brought a revolution in compact energy storage. They can hold more energy and discharge it faster than any of the common handheld battery technologies that came before them. Lithium-ion batteries are used, in some form, in devices ranging from smartphones to laptops to electric cars. Lithium-ion batteries supply 4.2V when fully charged. As their energy is drained, their voltage drops. When they reach 2.5V or so, they're considered empty. Although a lithium-ion battery can continue to supply power beyond that point, doing so will permanently damage the battery's chemistry. That might reduce the energy the battery can hold when full, render the battery useless, or cause an internal short circuit that could lead to a fire. The above doesn't need to put you completely off lithium-ion batteries. They're incredibly useful; you just need to take a little more care with them than other common batteries. Some lithium-ion batteries are more safe than others; that'll be covered below. You do need to be careful about where you buy your lithium-ion batteries. Many large marketplaces, like Amazon and AliExpress, have unsafe or mislabeled lithium-ion batteries for sale. Because of the dangers of unsafe usage of such batteries, you need to make sure you're getting them from a reputable seller. That will be covered in the buying lithium-ion batteries section. Some flashlights have built-in charging circuits. If yours doesn't, you'll also need a charger, covered in the chargers section. 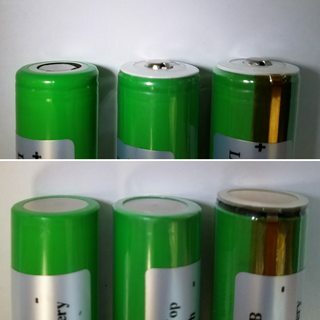 The Lithium-ion batteries that flashlights use--at least, flashlights with removable batteries--are generally cylindrical and are described by a five-digit identifier, like "18650". The first two digits give the diameter of the cylinder in millimeters (mm). The last three digits give the length of the cylinder in tenths of a millimeter. Thus, an 18650 cell is nominally 18mm by 65mm. There's some variation in those values, particularly in the length, but they give a rough approximation. 26650 - The 18650's larger sibling. Used by some flashlights to give more runtime per battery. 18350 - Almost half the size of an 18650. A number of flashlights have options for swappable longer and shorter battery compartments, so you can decide on a daily basis whether to have a shorter light that uses 18350s or a longer light (with longer runtimes) that uses 18650s. 16340 - More or less the same size as a CR123A. There are used in "RCR123A" batteries as described in the 3V section above. 14500 - More or less the same size as a AA battery. Some flashlights can use either AA or 14500 cells. Don't use a 14500 battery in a AA light unless the flashlight manual says you can. If the flashlight only expects 1.5V batteries, using a 4.2V 14500 can destroy the light and possibly start a fire. 10440 - More or less the same size as a AAA battery. Some flashlights can use either AAA or 10440 cells. Don't use a 10440 battery in a AAA light unless the flashlight manual says you can. If the flashlight only expects 1.5V batteries, using a 4.2V 10440 can destroy the light and possibly start a fire. A number of flashlights allow you to use either an 18650 battery or two CR123A batteries. As with 14500/AA and 10440/AAA, don't do this unless the flashlight manual says you can, since two CR123A batteries in series will give the flashlight 6V. With 1.5V batteries, you have just one thing to decide about: the battery chemistry. With lithium-ion batteries, there are four options you need to consider: protection, top shape, capacity, and discharge rate. If in doubt, you'll probably be okay with protected, button-top batteries of the highest capacity you can afford (ignoring discharge rate). Dimensions of plain, button-top, and protected 18650s. As noted above, lithium-ion batteries should not be discharged below 2.5V or so and should not be discharged too quickly. Many manufacturers take plain lithium-ion cells and add small protection circuits on top. These circuits stop providing power if the battery voltage drops too low or if the current draw gets too high, protecting the cell from things that could damage it. This makes the protected batteries a bit safer, since it's more difficult to accidentally push them too hard. A protection circuit makes the battery a little longer, and sometimes a little wider. There are flashlights that have so little extra space inside that they must be used with unprotected batteries. Usually such flashlights will have their own low-voltage protection (LVP) and will stop trying to use the battery if the voltage gets too low. If you use an unprotected battery in a flashlight without LVP, you'll have to be careful not to drain the battery too far or you risk permanently damaging the battery. Protected batteries usually cost a little bit more than their unprotected counterparts, typically in the realm of an extra $1.50 or so. Some high-powered flashlights need to draw so much current that they can't use protected batteries because they'd trip the protection with their power usage. For those flashlights, make sure you get unprotected batteries with a high enough discharge rate (covered later). Flashlights that need unprotected batteries should say so on their website and in their manual. If there's nothing about protection, you should be able to use protected batteries (and you ought to do so). Tops and bottoms of flat top, button top, and protected 18650s. Lithium-ion batteries, like all other batteries, have a positive end and a negative end. Putting a lithium-ion battery in backwards can damage the flashlight, the battery, or both. In some cases, it can start a fire. On a plain cylindrical lithium-ion cell, the disk on the positive end is a little smaller than the disk on the negative end. Some manufacturers take bare cells and put buttons on top of them, like the buttons on top of 1.5V batteries. This makes the battery a little longer, but not as much as a protection circuit does. Most unprotected-batteries-only flashlights will still work with button top batteries. Button top batteries usually cost slightly more than flat top batteries. The extra cost is generally somewhere around ten to twenty cents. Many flashlights will work with either button top or flat top batteries. Some are shaped so that only a correctly-inserted button top battery will work. This serves as mechanical enforcement of correct battery polarity. If your flashlight takes more than one battery in series, you'll need to use button-top batteries. Protected batteries pretty much always come with button tops. In general, any flashlight that works with flat tops will also work with button tops, except for rare cases where the battery compartment spacing is incredibly tight. Consequently, I'd recommend getting button top batteries unless you specifically know you need flat tops. A battery's capacity, most commonly measured in milliamp-hours (mAh), governs how long it can continue providing power. More mAh generally equals more flashlight runtime. Even if you don't expect to run a battery all the way down, keep in mind that as a lithium-ion battery discharges its voltage drops. In many flashlights, that means that a partially-discharged battery can't support the brightest modes on the light. A higher-capacity battery will continue to provide higher voltages for longer periods of time. If all else is equal, you should get the highest-capacity battery you want to spend money on. Depending on their particular chemistry, lithium-ion batteries can have a maximum discharge rate anywhere from 3 amps (A) to 40A. Most flashlights stay under 3A-4A, so pretty much any battery will be fine for them. Some of the higher-output flashlights need or can benefit from 10A, 15A, or even 20A batteries. There's a tradeoff between battery capacity and discharge. The chemistries that do very well on one metric are not as good on the other. As of January 2018, the best high-capacity batteries store 3500mAh with a maximum discharge of 10A, while the highest-discharge batteries can sustain 40A but only store 2000mAh. The most-demanding flashlights I've seen top out at about 20A, so you probably don't need to go out looking for batteries with higher discharge rates than that. (Unless you're also using the batteries in your vape or something.) Many people with high-drain flashlights like to use Sony VTC6 or Samsung 30Q batteries; both are 3000mAh/15A. Some people refer to high-discharge batteries as "IMR" batteries, after a commonly-used chemistry for such batteries. In general, you should see if your flashlight has a maximum current drain listed. If it doesn't, ignore discharge rate and get the highest capacity batteries you want. Otherwise, get the highest-capacity batteries with a high enough maximum discharge rate. There are all sorts of other characteristics that people care about with their batteries, but those are less relevant than the above four things, especially if all you care about is getting your flashlight to work. There's actually a really complex relationship between batteries' capacity, voltage, and current. Batteries are a little less efficient at higher amperages, so a flashlight that's constantly used on its turbo setting will generally drain its battery even faster than the numerical difference between the light's brightness levels would indicate. Similarly, batteries providing higher amperages will have their voltage drop a bit relative to the same battery with the same charge but at a lower current draw. Different batteries will have different balances among those relationships (e.g. Samsung 30Qs exhibit slightly more voltage sag than Sony VTC6s, even though their top-line ratings are the same). These sorts of things only tend to matter to people who want to squeeze every last lumen out of their lights, and those are just a small subset of the people who use lithium-ion flashlights on a regular basis. If you're interested in this level of detail, though, you will want to look at HKJ's battery and charger reviews. 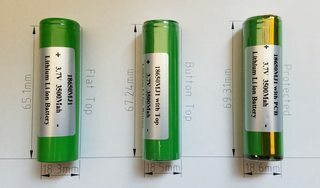 The website is a little confusing in its layout, but there's a wealth of information about all of the batteries HKJ has tested, and HKJ has tested a lot of batteries. Don't just go to Amazon, search for "18650", and buy the first search result. There are a lot of cheaply-made and more-unsafe-than-necessary batteries in large marketplaces like Amazon. You should buy from a vendor who will only sell properly-labeled stock from trusted manufacturers. If you have questions about a particular battery seller, you can always come ask about it on the /r/flashlight subreddit. Unprotected batteries are pretty much all made by LG, Panasonic, Samsung, Sanyo, or Sony. Many flashlight manufacturers have their own branded batteries. Those are generally of good quality, but they're often more expensive than equally-good batteries from other reputable sellers. Some people prefer to pay the extra amount just to avoid trying to figure out whether a particular other seller is reputable or not. Batteries from Olight are a little unusual. They're a reputable manufacturer (and seller, if you buy directly from them), but they do some extra things to their batteries. The tops of their batteries have a positive button, like any button top battery, but also a negative ring around the button. This is required for the batteries to work in their proprietary flashlight charging cradles, but it increases the chances of short-circuiting the batteries. (The protection circuit should prevent a short-circuit from starting a fire, but it's still not something you want to do to a battery.) Unless you're using an Olight flashlight with an Olight charger, you probably don't want an Olight battery. Ultrafire batteries should be avoided. They're known to cut corners on their batteries in order to make them cheaper. If you buy one of their batteries, you might get something that works, but you also might get a battery with a defective protection circuit, or a battery that contains a smaller, cheaper battery, and a lot of sand to fill the extra space. Given the care that needs to be taken with lithium-ion batteries, the risk isn't worth the lower prices. The best option is to look at the list of chargers reviewed by HJK, pick one with the features you need (number of bays, NiMH, lithium-ion, etc.) and a good rating (two or more smiling faces), and buy it from one of the reputable battery vendors discussed above. My social news feeds are awash with news of Trump's speech at the 2017 National Jamboree (full transcript, full video). I'm disappointed on a few levels, but I'm not leaving the Scouting program. I was a Boy Scout when I was a kid. I'm currently an adult leader with a Boy Scout troop. I think the ideals and the potential of the Scouting program are good. The short version of Scouting is that we strive to develop kids' citizenship (in the USA, but also in their community and the world), character, and fitness (both physical and emotional). We use a number of tools to accomplish those goals, but the one that most differentiates Scouting from other similar organizations, in my opinion, is what BSA (the Boy Scouts of America) calls "the outdoor program", i.e. all the stuff we do outdoors, including camping, fishing, hiking, and a whole host of other activities. BSA is not perfect; there are policies they have that I think should be changed, and bad adult leadership in a troop can give the troop's kids a bad experience. But I believe that the core goals and methods of the organization are good, which is part of the reason I am a scout leader. I want to make sure that the kids in my troop have the opportunities to get as much out of the program as possible and have good experiences while doing it. As part of BSA's focus on citizenship, the President of the United States is considered to be the honorary president of the BSA (though there's a separate actual president who actually runs the national board). Consequently, the US President is always invited to speak at the BSA National Jamboree, an every-four-year camping event that hosts troops from all across the US (and plenty from other nation's Scouting programs, too). Nineteen National Jamborees have been held (including the one currently underway), under twelve different sitting US Presidents (including Trump). Eight of those presidents have spoken in person at a National Jamboree during their term. (Neither Nixon nor Carter spoke at a National Jamboree while they were President. Reagan was scheduled to speak, but was unable to make it for health reasons, so Nancy Reagan spoke in his place. Obama recorded a video that was played at the Jamboree.) The BSA's Bryan on Scouting blog has a history of presidential visits to National Jamborees through Obama. So whether you like Trump or not, it was reasonable (in my opinion) for him to be invited to speak at this year's National Jamboree, on the basis of Jamboree tradition and in the spirit of developing citizenship in young Scouts. That said, Trump took a disappointingly political tack with his speech, seeming to treat it as a campaign rally. Officially, the Boy Scouts of America is a non-partisan organization. Everyone should be able to benefit from the skills, knowledge, and experiences available through Scouting, regardless of political viewpoints, so no one should feel excluded because of their viewpoints. Past presidents have focused on non-partisan topics, emphasizing things like community service and being a good citizen, in their Jamboree speeches. Trump had a fair amount in that vein, but he kept dropping in things like his usual digs at the media or complaining that he hasn't been shown enough "loyalty". There was actually a lot of good stuff in his speech, but it seemed like he couldn't avoid making every few paragraphs about himself, in a partisan, exclusionary manner. (Plenty of past presidents used their speaking opportunity to highlight things they saw as personal accomplishments, but they all presented those things as examples of citizenship or service in line with the ideals of Scouting.) He also managed to use language that most Scout leaders would at least frown on, were it uttered by one of their troop members at an event, and referenced apparently risque activities in a fairly approving manner. I was also disappointed at the members of the audience who went along with Trump's partisan digressions, booing Clinton and Obama while cheering things like the GOP-supported, Democrat-opposed effort to repeal the Affordable Care Act. I'm not actually surprised that Trump treated his speech like a campaign event. It still saddens me, but it's entirely in keeping with his demonstrated character up to now. I had hoped, however, that Scout leaders would understand that sort of partisanship is inappropriate at a Scouting event. It is, of course, hard to tell just how many people were participating, but it was enough that the TV cameras could pick them up. But despite all that, the instances of angry, divisive speech from President Trump to the Jamboree crowd do not represent Scouting as a whole. I'm sure there were some people in the audience who would be happy chanting "Lock Her Up" at a genuine Trump rally, just as I'm sure that there were among those 40,000 people some who have marched in anti-Trump protests. I think, however, that most scout leaders care primarily about encouraging their kids to be better people without having to pick a political team and without having to shut out anyone on the opposite side. If you have qualms about Scouting, go visit some troops in your area and see how they work. The scouting program is big and it provides a lot of resources for individual troops, but what defines each one is really the adults and kids in that specific troop. Each troop has its own character. Some are bad environments for youth development, which makes me sad. Some are good environments that maybe just aren't the right fit for your particular child. But most troops are friendly and welcoming, and in most places there should be at least one where your child will feel comfortable and engaged and where there are people who will help your child develop into a healthy citizen of upstanding character. Google recently came out with a "Best Apps of 2014" list. It was not well received, with many people feeling that the majority of apps present were there because Google was making money from them, not because they actually deserved to be on such a list. Consequently, the Android subreddit attempted to compile its own list. This post is my attempt to collect the most highly-voted submissions on that /r/Android post. What follows are the 35 top apps, based on Reddit's "best" sorting algorithm. If I have time, I'll add more to the list later. Gives you root on your system. Google Play: SuperSU - Free, IAP. IAP is only for donations; you have to buy the Pro version if you want its extra features. Google Play: SuperSU Pro - Paid. SSH client with optional cloud syncing and other features. Google Play: JuiceSSH - Free, IAP. IAP is for upgrade to Pro version with extra features. There are also plugins available on Google Play. Some plugins are free; others are paid. TV episode (and movie) watching management. Tracks things you've seen, tells you about upcoming things. Syncs with trakt or tvtag. Google Play: SeriesGuide - Free, IAP. IAP is for a yearly subscription to unlock paid features. Google Play: SeriesGuide X Pass - Paid. A one-time purchase of this app will unlock the paid features in SeriesGuide. It's equivalent to the yearly subscription. Podcasting app. "Buy it for the hilarious changelogs, stay for the awesome Podcast App." Album app. Browse, display, and select images on your device. Alternate home screen. Very customizable. Google Play: Nova Launcher Prime - Paid. Unlocks some features in Nova Launcher. Manage your device from your desktop or laptop web browser over the network. You can transfer files, send and receive SMS messages, see notifications, and generally fully control your Android device. Google Play: AirDroid - Android on Computer - Free. If you create an AirDroid account, which is not required but makes some things more convenient, you can get access to more features with the account by paying a monthly or annual subscription fee. Easily send information between your device and desktop computer. Serves as both a cross-device notification system (e.g. see your Android notifications on your desktop) and a data sharing system (e.g. send a URL from your laptop to your phone). Google Play: Pushbullet - Free. Currently no profit model(!) Will probably add premium accounts in the future. Take photos of documents with your phone and turn them into PDFs. Google Play: CamScanner -Phone PDF Creator - Free, Ads, IAP. IAP is for a monthly or annual subscription that removes ads and adds a number of features. Google Play: CamScanner HD - Scanner, Fax - Free. I think this is the same as the basic CamScanner but with a tablet UI. It doesn't seem to have the IAP subscription option, though. General-purpose automation for your Android device. Fitness app for tracking your running and bicycling. Google Play: Strava Running and Cycling GPS - Free, IAP. IAP is for unlocking premium features. Google Play: Today Calendar - Free. Trial version that expires after 30 days. Game. The gameplay's a little difficult to describe. You control two objects that rotate in sync around the same point and you have to move them to avoid obstacles. Google Play: Duet - Free, Ads, IAP. The IAP removes ads and unlocks a few features. Humble Bundle: Duet was part of Humble Moble Bundle 6. The version in the bundle was the Premium version, with no ads and all features unlocked. Sleep tracker and sleep-cycle-aware alarm clock. Google Play: Sleep as Android - Free, Ads, IAP. Functions fully for two weeks as a trial, then disables sleep tracking on particular weekdays (though the other functionality continues to work). IAP is an alternative to purchasing the unlocker app. Google Play: Sleep as Android Unlock - Paid. Unlocks sleep tracking and turns off ads in the Sleep as Android app. Synchronizes device data with a Microsoft Exchange Server. Google Play: Nine - Exchange ActiveSync - Free, IAP. Works for two weeks then disables itself. IAP activates the app permanently. Very customizable, multi-featured, and good looking clock app. Has a clock, alarm clock, timer, and stopwatch. Reddit client with a card UI. Google Play: reddit sync - Free, Ads, IAP. IAP removes ads and is an alternative to purchasing Reddit Sync Pro. Google Play: reddit sync pro - Paid. Ad-free version of Reddit Sync. Security program. Lets you track, manage, and even wipe your device remotely in case it's lost or stolen. Google Play: Cerberus anti theft - Free, IAP. App is functional for a week. After that, you have to buy a license via the IAP. Traffic-aware GPS routing and navigation. Google Play: Waze Social GPS Maps & Traffic - Free, Ads. Sync local folders to various cloud storage providers. Google Play: FolderSync Lite - Free. Limits you to two cloud storage accounts and you can't filter your files to be synced. Google Play: FolderSync - Paid. No account limits, sync filtering, and Tasker support. Google Play: IFTTT - Free. Some companies pay IFTTT to promote recipes that use their sites. Kind of the reverse of AirDroid. Lets you manage your desktop computer from your phone. Google Play: TeamViewer for Remote Control - Free. The desktop software is free for noncommercial use, but businesses and the like have to buy licenses. Offline maps. Not available in the Play Store, so you have to sideload it. Client for the Plex Media Server. Shows notifications while the phone is locked. Detects when you pull your phone out of your pocket and turns on the screen to show your notifications. Similar in concept to the Moto X's Active Display. Google Play: AcDisplay - Free, IAP. IAP is only for donations; app is fully-featured as-is. Alarm clock that lets you define a sequence of steps necessary to turn off the alarm. The idea is that you encode your entire morning routine into it, which makes sure you're awake by the end and makes sure you do everything you're supposed to. Journey planning app, including transit, auto, foot, bike, and taxi. Only for specifically-supported cities. Framework for installing Xposed modules. Each module patches some aspect of the running system in order to change it. There are modules for all sorts of things, from working around Android bugs to adding cosmetic tweaks to making stock Android behave like a custom ROM. Root required. Must be sideloaded, since it's not in the Play store. Google Play: Solid Explorer File Manager - Free. Disables itself after 14 days. Google Play: Solid Explorer Unlocker - Paid. Unlocks the main app so it'll continue functioning after the trial period has expired. I periodically need to set up a USB hard drive so that its files can be shared between different operating systems. I recently tried to update my practices. This is a record of my findings. The short version of my conclusions is: If you need good portability between Windows, OSX, and Linux (and you're only writing data from Windows or Linux), use NTFS. If you don't need filesystem metadata like ownership or permissions and your files and disks aren't too large, FAT32 might work for you. FAT32 is often the filesystem of choice for flash drives and smaller media. Windows, OSX, and Linux all have native support for it. It can span filesystems up to 2TB in its default configuration and up to 16TB or so if you tweak its block size. It cannot support files larger than 4GB, nor does it include support for file ownership and permissions. Its support for filenames longer than eight characters plus a three character extension is something of a hack. It's not case-sensitive (though it does preserve case). Basically, FAT32's biggest strength is its cross-platform support. In most other areas it falls down when compared to more modern filesystems. NTFS is a bit nicer than FAT32 in many ways. It supports filesystems up to 16EB in size, and you can fill all of that space with a single file, if you want. (In other words, there's effectively no limit on file size other than the size of the containing filesystem.) Filenames can be up to 255 characters long, just like other modern filesystems. NTFS supports POSIX-compatible file ownership and permissions, hard and soft links, case-sensitivity, and sparse files, all of which which make it a lot more interoperable with Unix than FAT32. exFAT is an attempt to extend the aging FAT family (FAT12/FAT16/FAT32) to support larger files. Its size limits are somewhat crazy: maximum recommended filesystem size is 512TB (though it can theoretically go up to 64ZB); maximum file size is 127PB. Like FAT32, it does not support file ownership or permissions, hard or soft links, or sparse files, and it's case-preserving but not case-sensitive. Many of the unsupported features aren't completely necessary in a lot of USB drive use-cases, so their absence isn't an immediate strike against it. The main problem with exFAT is that it's not just proprietary (like NTFS) but patented. It's supported natively from Windows Vista on (and Windows XP can be patched for support) and in OSX 1.6.5 (Snow Leopard) and later, but Linux support is currently very shaky and difficult to distribute because of the patents. Even if Linux support were not a factor, the fact that only relatively new OSes have support for exFAT would disqualify it from consideration in many situations. UDF is something of a dark horse in this space. It was originally designed as a general-purpose, portable filesystem. It's only really seen adoption, though, as the filesystem used on DVDs and Blu-Ray disks. Because it's used for DVDs, though, it's natively supported by all three of the major desktop OSes: Windows (back to Windows 95), MacOS (back to OS 9), and Linux (back to kernel 2.2). Like FAT32, UDF can only have 232 blocks in its filesystem, so it only goes up to 2TB filesystems with 512-byte blocks (which is what hard drives would use; the UDF spec requires that the UDF block size match the disk block size). Like NTFS, though, its only limit on file size is the size of the containing filesystem. Also like NTFS, it supports POSIX ownership, permissions, and metadata; ACLs; and hard and soft links, as well as being case-sensitive. It doesn't support sparse files. It would seem that UDF would be the best choice for a portable filesystem: it's natively supported in practically every OS and it supports most of the features you'd want in a modern filesystem. Unfortunately, OS bugs hamper its usefulness. Although Linux will read UDF filesystems with blocksizes other than 512 bytes (even though that's outside the official specification), Windows is pickier and will only recognize conforming layouts with 512-byte blocks. That immediately limits Windows to 2TB disks or smaller when using UDF. Also, Windows expects UDF to span the entire disk, with no partitions, so you can't even work around the size limitation by making multiple sub-2TB partitions. There are also the native disk formats for Linux (the ext2/3/4 series) and MacOS (HFS/HFS+). While there's at least some support for accessing them from other systems, that support is generally less robust than the NTFS-3G project's work, so if you're going to require third-party support for cross-platform access you might as well use NTFS. There are a lot of other filesystems out there. Linux has native support for quite a lot of them. OSX and Windows don't. In cases where installing third-party drivers on OSX or Windows is an accepted requirement, some other filesystem might be a good choice. In my opinion, though, NTFS, FAT32, maybe UDF, and possibly exFAT cover the filesystem portability use-cases pretty well by themselves; it would have to be a very specific set of circumstances for a different filesystem to be a better choice than one of those four.